What is technology? Why does it have such power in our lives? Why does it seemingly progress of its own accord, and without regard to social or environmental well-being? The quest for the essence of technology is an old one, with roots in the pre-Socratic philosophy of ancient Greece. It was then that certain thinkers first joined the ideas of techne and logos into a single worldview. The Greeks saw it as a kind of world-force, present in both the works of men and in nature itself. It was the very creative power of the cosmos. In the 20th century, German thinkers like Dessauer, Juenger, and Heidegger sought the metaphysical basis of technology, with varying success. French theologian Jacques Ellul argued persuasively that technology was an autonomous force of nature that determined all aspects of human existence, but he neglected the metaphysical underpinnings. Recent writers in the philosophy of technology have generally eschewed metaphysics altogether, preferring to concentrate on constructivist models or pragmatic analyses. 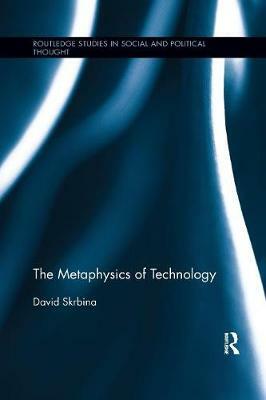 In the present work, Skrbina returns to a classic metaphysical approach, seeking not so much an essence of technology but rather a deep and penetrating analysis of the entire technological phenomenon. Drawing on the Greeks, he argues for a teleological metaphysics in which increasing order in the universe is itself defined as a technological process. On this reading, all of reality constitutes a technical sphere, a "pantechnikon," of universal scope. This work - the first-ever book-length treatment of the topic - breaks new ground by providing an in-depth and critical study of the metaphysics of technology, as well as drawing out the practical consequences. Technology poses significant risks to humanity and the planet, risks that can be mitigated through a detailed philosophical analysis.